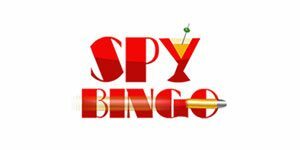 Spy Bingo Casino will then reward you with a bonus (Welcome Bonus is for new players only). The terms and conditions of the bonuses vary between different casinos and might also change over time and between different countries, so it is important to compare the different offers and read the T&C for Spy Bingo Casino before signing up. Bullets, martinis and high end lifestyle are the trademark of Spy Bingo Casino. Do you enjoy these things? Then stay tuned to learn more! 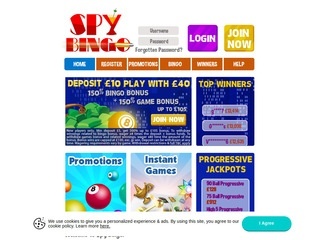 Spy Bingo Casino is a powerful release launched by Cassava Enterprises Gibraltar Limited that has since its conception been rewarded two licences – by the UK Gambling Commission (UKGC) and Gibraltar Betting and Gaming Association (GBGA). Its fashionable, modern-looking design is what draws most clients in, and its offering and winnings they reward you with is what makes them stay. The venue battles problem gambling devotedly and has free counselling for clients in need. Since it utilises the advanced SSL (Secure Sockets Layer) encryption, no cyber thief will ever spy into your sensitive data. Powered by the distinguished Dragonfish platform who has been working closely with the 888 Holdings Group for years now, Spy Bingo Casino’s library of games outshines may an online casino. While this online gaming firm does not run any live dealer games, it does show off a litany of video slots coming from the likes of NetEnt, Eyecon, Amaya, Gamesys and many others. In addition to the hottest casino game, there are also scratch card games and a few lottery games for casual players. All in all, Spy Bingo Casino is a place to try relax your mind and unwind while getting richer than you have ever been. The navigation is kept pretty simplistic, so we are sure you will have no difficulty finding the games you like. As a Cassava Enterprises site, Spy Bingo Casino’s clients have access to some splendid video slots. Coming from award-winning slot manufacturers, Spy Bingo Casino’s slot collection shines with top notch fan favourites such as Starburst, Raging Rhino, Da Vinci’s Diamonds and Shaman’s Dream. Other genres such as history, romance, fantasy and horror are also present in a wide range of top tier slots. Banded titles such as Bruce Lee 2 are also on board, so wake the warrior in you! What is more, Spy Bingo Casino will reward you with a mass of progressive jackpots that will fill your pockets. Have a spin or two and enjoy a lifetime of wealth. Your options in the realm of jackpots include Millionaire Genie, Superman and Treasure Fair. For the time being, Spy Bingo Casino does not host any table games. Much like most Cassava Bingo-oriented online gambling establishments, Spy Bingo Casino possesses a line-up of supreme Bingo games. The variants include 75 Ball Bingo, 90 Ball Bingo 52 Ball Game, all of which are played in interactive Bingo rooms that boost your mood and raise your spirits as you play. Allowing you to chat with your fellow Bingo players, Spy Bingo Casino also has a help page for all Bingo variants at hand. As for other casino games, you can play on a diapason of scratch card games, Keno and other instant games. Spy Bingo Casino does not host any live dealer games in its library. Spy Bingo Casino offers a wide range of ewallets, credit and debit cards and other banking methods to its clients. The ewallets encompass Neteller, PayPal, Entropay, and Paysafe Card, whilst your card options include Visa, Visa Debit, MasterCard, and Maestro. Alongside those, you can also opt for bank wire transfers and cheques for both depositing and withdrawing, whereas there is also the pay via phone service open for wagering only. Each month you can get paid out up to 8,000 EUR, in your currency of choice and those include British pounds sterling, Euros, American dollars and Canadian dollars. Following the industry’s standards, Spy Bingo Casino’s ewallets take the least to have your request processed, and you will have your money within 48 hours. The cards might take up to 3 days in total, while bank transfers and cheques might last anywhere from 7 to 28 days, respectively. Fast and helpful, Spy Bingo Casino’s customer service team is there for your convenience 7 days a week. All you need to do to get instant help thru the Live Chat facility is to log in to your account and go to the help room. The working hours of the live facility are between 10 am and 2 am CET every single day. For lengthy written enquiries that are not urgent, you may want to use the on-site enquiry form. Simply fill out the body of the message, leave your name and email address; the agents will get back to you in 72 hours at most. On the other hand, if you prefer to talk, you can call the online casino’s toll free phone number for UK players 0800 901 2510. Calling from abroad will likely induce additional charges. The phone service works also between 10 am and 2 am CET. All other general and frequently asked questions are answered within the FAQ section of the website.